You can bet that with very little meat on our table recently, we’ve been eating a lot of beans! And we’ve tested A LOT of different hummus recipes. Some with pesto or roasted red pepper. But honestly, we keep coming back to this one. This hummus recipe is our favorite and almost classical in a way. It’s not fussy or complicated. It doesn’t even call for tahini! But it’s hands down our favorite, and incredibly delicious! Have I also mentioned that my husband LOVES Greek food? There was a time when I used to marinade chicken thighs in homemade Greek salad dressing and he’d cook them on the grill. I’d take extra dressing and toss it with a Greek pasta salad with big chunks of tomato, red onion, feta cheese and olives. I’d make this Greek couscous as well, simple roasted broccoli and homemade pita bread and he’d be in food heaven the entire night. Of course, it’s a neck-and-neck race with tacos. Start a round of slow cooker carnitas and the man is putty in my hands! But his vegan experiment meant no chicken, and I wanted to come up with a way to get some quality protein into dinner that would help keep his belly full. That’s how the hummus recipe experiment began. 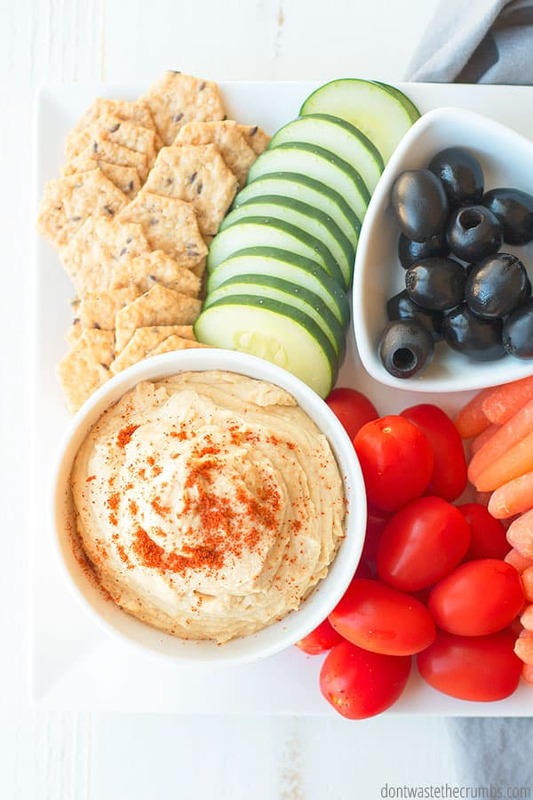 In case you didn’t know, hummus is vegan, gluten-free and incredibly healthy. The ingredient list is super short, and as long as you’re using quality olive oil, you’re good to go. There’s actually no reason to buy hummus, because it’s SO easy to make your own. You can make it in a food processor or in a blender, and I promise that once you make it once, you’ll never to back to buying it at the store. Plus, making it yourself is cheaper! 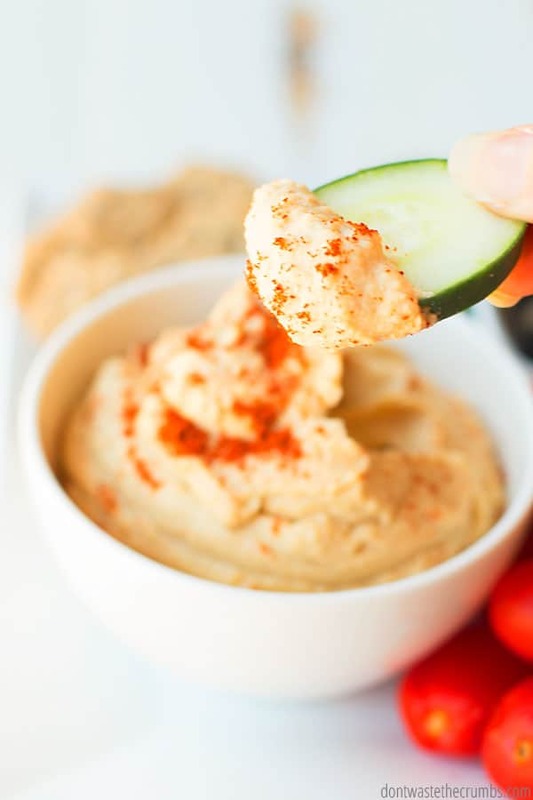 And since hummus is mostly made up of garbanzo beans – which tend to make people gassy – you can take pre-emptive measures so that your hummus doesn’t give you gas. In order to make hummus, you need garbanzo beans. These can be canned or cooked from dried beans. Cooking dry beans from scratch is always the cheapest option, and you can see the break down in the math in this article. You can save even more by buying your beans in bulk. If stored properly in a cool, dark location, they’ll last up to a year! If beans tend to make you gassy, you’ll also want to cook your own beans. I explained in this article how to de-gas beans, but those with super sensitive bellies can add a strip of kombu (seaweed) to the beans during the soaking process as well. That can also to help break down the enzymes that give you tummy troubles. I’ve also read that adding a slice of ginger, some fennel seeds or cumin seeds can also help. Whatever you add to your beans in the soaking process, be sure to remove them before you start cooking the beans. Using a small re-usable meuslin bag or a metal tea ball or even a silicone tea bag can help keep the small seeds together, and make it easier to remove them later on. 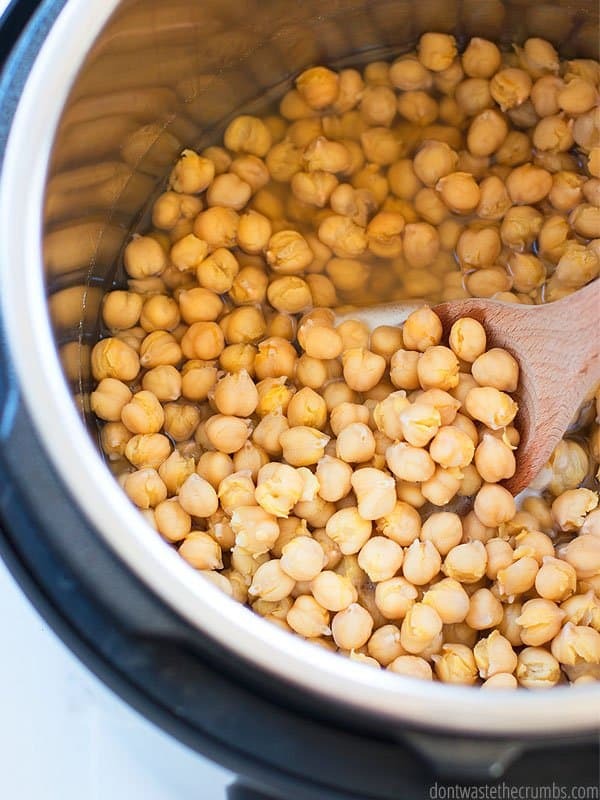 My preferred method for cooking garbanzo beans is the Instant Pot, although you can easily use a slow cooker too. (Psst – if cooking with a pressure cooking freaks you out, don’t be scared! Here are 20+ things you should know before you take the plunge and buy an Instant Pot. Once you’re ready, learn how the Instant Pot can save you money and how you can make your favorite slow cooker recipes in an Instant Pot too. Should you peel the garbanzo beans first? There’s a discussion on the internet as to whether or not you should peel the garbanzo beans first. No doubt, peeling the beans first will yield a creamer hummus in the end. But to be honest with you, I don’t have time for that. 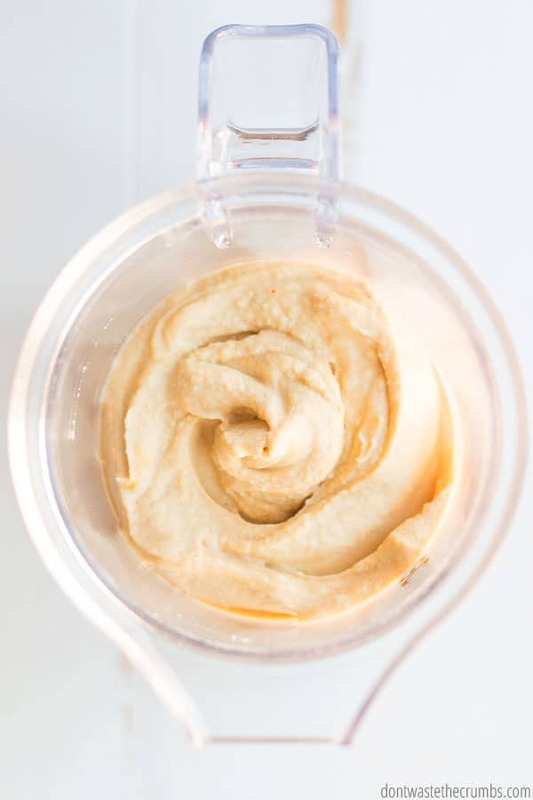 I’d rather add an extra tablespoon of water to make it smoother or an extra round or two in my Blendtec Blender than stand around the sink, taking the skin off the garbanzo beans. Can you use canned beans? Of course! Be sure you drain the liquid from the beans first. This is called aquafaba and CAN be used in vegan recipes, but it’s also where you’ll find the enzymes that cause gas… so that’s your call. If you use canned beans, make sure you rinse them 3 times, thoroughly. I mentioned earlier that this recipes doesn’t use tahini. Tahini is sesame seed paste, and while you CAN find it at a regular grocery store, I feel like it’s on the pricy side. And considering one of the reasons we make hummus is because beans are cheap, it seems counter-intuitive to add an expensive ingredient to the recipe. 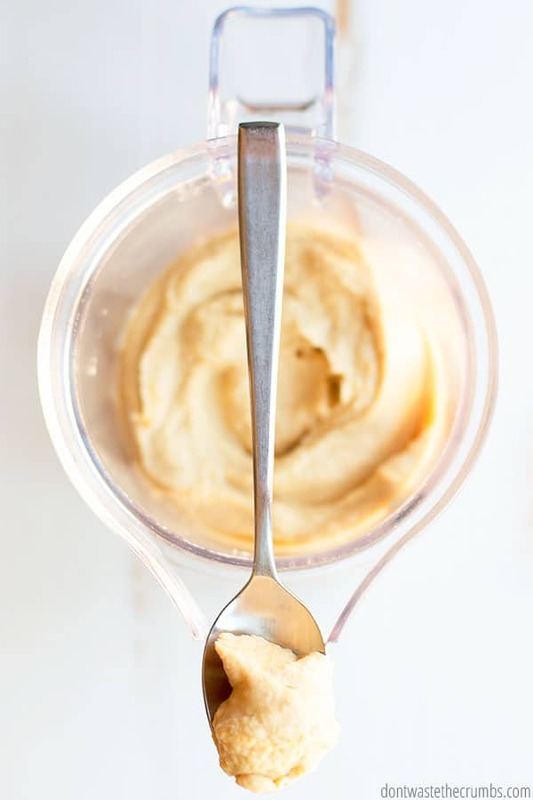 I’ve heard of substituting almond butter for tahini, but when we did that, the almond butter flavor was very pronounced. My husband even said, “It tastes like almond butter and beans…” which is not exactly what I was going for. Instead, we can use olive oil and still get delicious results without adding to our grocery tab! (Note: It’s important that you use quality olive oil. Olive oil (and honey) are two of the most “fake” ingredients found in the supermarket… meaning, they’re not really what they say they are. Many honey jars on store shelves are actually corn syrup, and many extra virgin olive oils aren’t first press AND are mixed with other oils like canola oil. (You can try this quality raw honey). Extra virgin olive oil isn’t cheap, so we use the fridge test to make sure we’re getting what we paid for. It isn’t an official science test, but I trust it. Here’s where our massive boosts of flavor come into play. Garlic. Make sure you use fresh garlic here. The flavor of granulated garlic doesn’t come through nearly as well, and it will taste like something is missing. You can peel your own OR use the garlic that’s been peeled for you (that’s what I keep in the fridge) OR you can use the jars of minced garlic. All will work well. Cumin. This isn’t typically a Greek spice, but it really tastes good in this hummus. Cayenne Pepper. You don’t need much to give the hummus a kick, but you do need it. I recommend using ¼ tsp if you have anyone who is sensitive to spicy things. Remember you can always add more if you like it spicy! Salt. Salt brings out the natural flavor in everything, so you can’t skip it here… unless you’re using canned beans that had added salt to them. By the way, hummus isn’t just for dinner anymore! We often make “dessert hummus” for snacks, since I’ve lowered the sugar content and it’s made of beans which are healthy. It’s just the NAME of the recipe that makes it sound like dessert! My kids really like chocolate hummus, but my favorite is chocolate chip cookie dough hummus. I could literally eat it with a spoon! 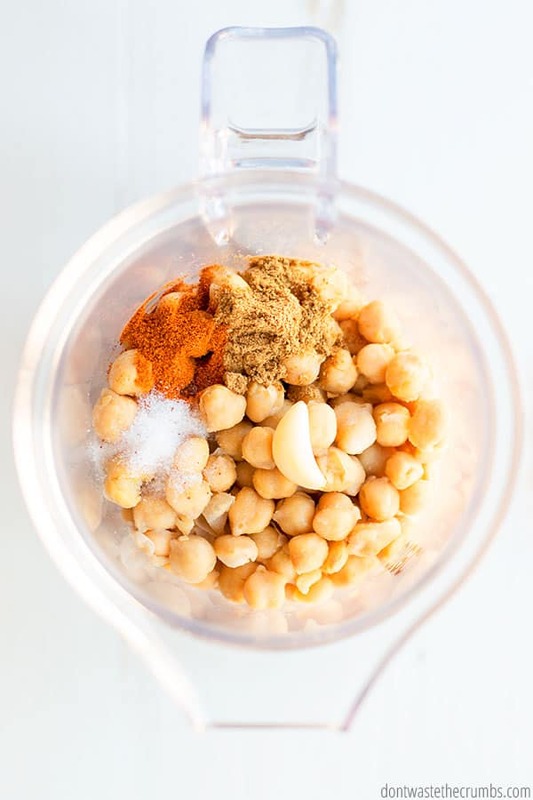 Put the garbanzo beans, olive oil, ½ Tbsp lemon juice, spices and 2 Tbsp of water in a food processor OR a high powered blender (I have a Blendtec Blender). Process the beans until they are smooth. You may need to add water, 1 tablespoon at a time and up to 2 additional tablespoons, in order to achieve the right consistency. Taste the hummus and add additional spices or lemon juice if desired. I almost always add a total of 1 tsp of cumin and ¾ tsp of cayenne pepper. Process again and taste again, adjusting the spices as needed. Serve with raw vegetables or homemade pita bread! Click here for more info on how to trim your monthly grocery budget by $200 or more! 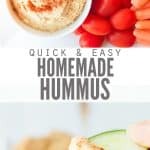 Do you make hummus often? Do you like it flavored or spicy or plain? And most importantly, do you make it with tahini or do you skip it? Leave your thoughts and ideas in the comments section below! 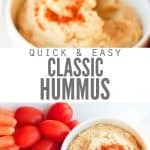 Personally I love hummus with lemon but other than that, the recipe looks great! Thanks for all the wonderful recipes and money saving ideas. I’ve shared your blog with lots of my friends and get happy responses. 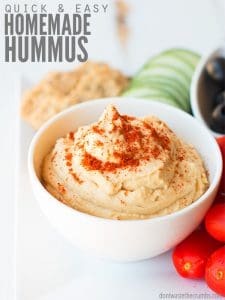 I do add tahini to my homemade hummus- but just 1Tbsp per batch. This actually makes it pretty economical, and you get that authentic taste.